Michael Cohen, Trump Surrogate, Can’t Vote for the Boss in New York – He’s a Registered Democrat! It just doesn’t get much richer this. 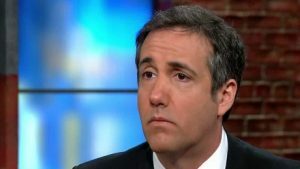 Trump lawyer and main surrogate Michael Cohen will not be able to vote for “the Donald” in the New York primary – because he’s a registered Democrat! New York has a closed primary, which means that a person may only vote in the party’s primary with which the person is registered. Well, Mr. Cohen, you can still vote in the Democratic primary – maybe “Feel the Bern” a bit.